The ROI of Social Media is a must-read for any business looking to get the most out of their investments in social marketing. It sets the stage for marketers to interact with influencers, individuals and consumers and explains the relationships between them. This book breaks down into simple terms both "dollars" and "sense" for social marketers to live by. Fundamentals, strategies and tactics …this book has it all. 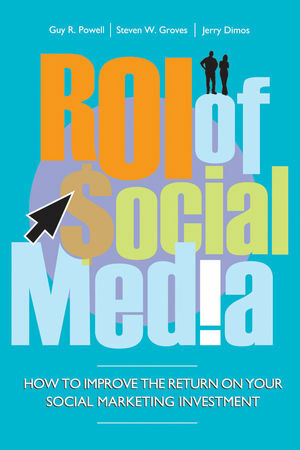 The ROI of Social Media will be the dog-eared book that sits on the corner of your desk used to prove many a point. Guy R. Powell is the President and founder of DemandROMI where over the last 20 years he has helped clients from across the globe build highly successful and measureable marketing strategies to drive increased revenue, profit, brand and share. As part of his consulting activities he has trained and/or presented his findings and methods to thousands of marketers across the globe. His consulting career began with ATKearney delivering strategic and tactical solutions to help companies fuel and maintain extraordinary growth for mid-tier and Global 1000 companies. He has experience with many Fortune companies in sectors including CPG, financial services and high technology. Powell’s educational background includes an MBA from the University of Chicago and a BSEE from Lehigh University. SECTION 1—Getting Started with Social Media ROI. Chapter 1—Getting Started with Social Media ROI. Chapter 2—Social Media Motivations and Behaviors. SECTION 2—The Media Engagement Framework. Chapter 3—Introduction to the Media Engagement Framework. Chapter 4—Influencer Persona in the Media Engagement Framework. Chapter 5—Consumer Persona in the Media Engagement Framework. Chapter 6—Individual Persona in the Media Engagement Framework. Chapter 7—The Competitive Set—Vying for Attention. Chapter 9— Search–Being Found in Social Media. SECTION 3—Practical Applications of Social Media ROI. Chapter 10—Putting Values to the "R" and "I" of ROI in Social Media. Chapter 11—Eight-Step Process to Measuring Social Marketing Strategy and ROI. Chapter 12—Social Media Metrics Tools Providers. SECTION 4—Where Does Social Media Go from Here? Chapter 13—The Future of Social Media and ROI.